Here’s a list of seven bestplaces to view Aurora Borealis. Iceland, the country of glaciers, geysers and volcanoes is the perfect place to catch the Aurora Borealis in all her full glory. The best time to see the Northern Lights is sometime between early September and end of April. Enjoy the ethereal view from the private confines of your campsite or the luxury of thermal hot springs. Iceland even has a few beaches, the Northern Lights near the rippling ocean looks surreal. The lights can be spotted from anywhere in Iceland. We recommend sites closer to the Arctic Circle, like Seltjarnarnes in Reykjavik, Vik, Látrabjarg/Westfjords, Eldborgahraun, Djúpavík for an up-close experience. The Jokulsarlon Glacier Lagoon, on the southeast coast of Iceland, is one of the best places to get a complete view of the lights. The area is full of icebergs and glaciers that reflect the colors everywhere, making the experience all the more magical for you. Check the weather report before you set off; you don’t want to be caught amidst a heavy snowstorm or blizzard in the middle of nowhere. Greenland remains till this date the final frontier for the average traveler, the north and western parts of the land are completely covered by thick layers of ice. The southeastern part, however, is more optimal for catching the Aurora Borealis. Mid-August to late April is the best time to visit south Greenland. The island is especially beautiful during winters, i.e. end of September when there’s no midnight sun to hinder your view of the Northern Lights. But, if you’re planning a trip to Nuuk, we suggest you postpone it towards the latter half of August. Pack some warm linen, the place is freezing cold. For instance, the Qaleraliq Glacier in the south-end has floating glaciers even in the summer months! Greenland has over 300 clear-sky days every year making it the ideal campout spot for aurora hunters.Kangerlussuaq, Ammasalik, Nuuk are the top spots for catching the light show as soon as it gets dark. Canada is home to many natural wonders of the world including the Niagara Falls, Bay of Fundies and the Canadian Rockies. The northern half of Canada also expands into the Arctic Circle, giving travelers a spectacular view of the Aurora Borealis. Set far from the main city, the low pollution air, clear moonlit sky, and surrounding icebergs create the perfect setting for the grand show. The territory around the Great Salve Lake boasts of a unique Aurora Village that organizes special activities for tourists.Wood Buffalo and Jasper National Park are some of the popular spots for catching the lights in this aurora viewing paradise. Experience the brilliance of the Aurora Borealis from the Illuminated Tepees in Yellowknife. The back-town areas around Lake Superior in Ontario are another prime location you should consider during your stay in this tundra country. The glowing sky shines as far as the south of American border, but we suggest you stick to the wilderness of Canada for the front row seats. Alaska is the nearest to the North Pole and the best place to view the Aurora Borealis. In fact, Fairbanks is but two degrees below the Arctic Circle. You cannot get closer than this to the Aurora Borealis! Fairbanks is hands down the best place to spot the lights; it even has a forecast system of its own for accurate weather reports. Join the tour groups organized by the state as they leave the city and venture into the quieter hills and forests of Alaska. Visitors love the view from the Denali National Park and the Yukon Territory that houses the Geophysical Institute of weather forecasting. The best time to catch the Northern Lights in Alaska is from early December to mid-March. Farther afield, there’s the village of Manley Hot Springs where travelers can watch the sky lit up by a thousand hues whilst being cocooned in the warmth of a spring-fed hot tub. The Northwest of Sweden, known for its wilderness, offers some of the most surreal, jaw-dropping sightings of the Aurora Borealis. And the temperatures here are milder, more habitable than most other places we’ve discussed on the list. The Abisko region is particularly popular among tourists thanks to its microclimate conditions. Flanked by the 43-mile long Torneträsk Lake from all sides, it creates a “Blue Hole of Abisko”- an area where the skies are clear and cloudless no matter what time or season of the year you’re visiting. The pristine snow-capped peaks of the Kimura ranges nearby form the perfect backdrop for the show. The lights appear all year round, though we recommend you visit the country sometime during September to the end of March. Most lodgings in the area offer expeditions to the northern corners of the country in husky sleds and snowmobiles. Finland or the “land of the thousand lakes” is covered by forests and mountain ranges from all sides. The Aurora shines almost every other day in the northern part of the country from September to March. However, the weather might not always be to your liking, the freezing cold temperatures are very uncomfortable to stay in. Don’t worry though; you can spend your days in an authentic glass igloo with open ceilings that offer a clear view of the colorful lights in all their grandeur. Kakslauttanen is a popular aurora spot for travelers where you can enjoy the view in the lap of luxury. Even in Luosto, a tiny village in the north of Finland, you can catch the Aurora spreading her lights from one side of the horizon to the other. The place offers a variety of outdoor activities like skiing, snowmobiles,andhusky-sleds for the adventure junkies. Norway with its giant fjords, gaping glaciers, and vibrant fishing villages is more than just an aurora viewing location. The top hot-spots to catch the lights are Svalbard, Tromso, The Lofoten Islands, Harstad, Bodo, Alta, Andoya, and Lakselv. Rent a log cabin or a caravan for an authentic experience of the North. Norway tourism organizes special expeditions to the outskirts where you can catch the uncut uninterrupted display of the Northern Lights. The village of Ersfjordbotn, 12 miles from Tromsø, the Lofoten Islands and the far northern towns of Alta, Nordkapp, and Kirkenes are some of the best spots you can check out. 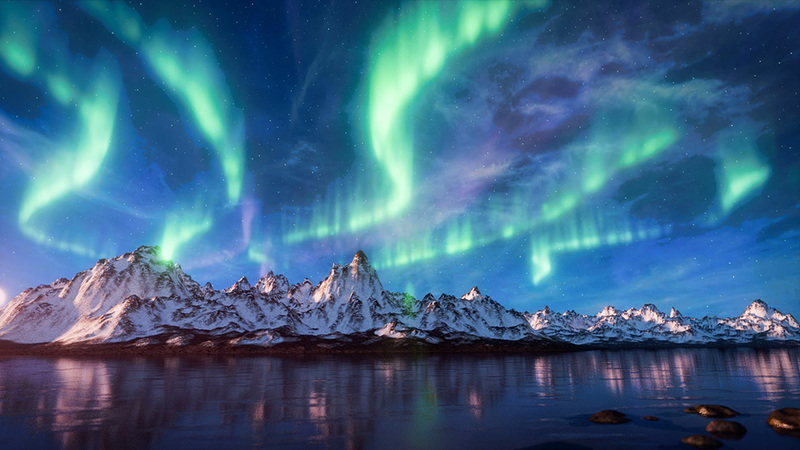 We suggest you visit Norway somewhere during Mid-September to late March to catch the best view of the lights. Northern Lights are on the bucket list of almost every traveler and rightfully so. This holiday season plan a trip to any of these seven places. It is not every day that you get to see the greatest show on earth, do you?